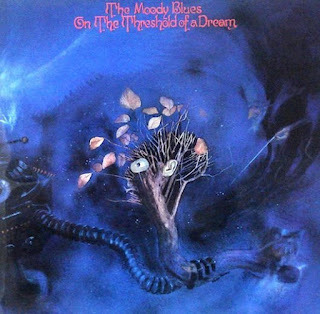 I can’t possibly write on the theme ‘Red Letter Day’ without mentioning The Moody Blues. Sorry if you’ve heard it all before and if you know me you will have had chapter and verse for years – I’ll try to keep it brief. I’ve lost count of how many concerts I’ve attended and which towns and cities I’ve stayed in ‘on tour’. I loved being on my home turf at the Manchester Apollo, 2004, waiting outside after the show, as close to their tour bus as possible. This ritual has rewarded me many times with waves, smiles, autographs and photos, usually in the nano-second it takes for a band member to emerge from the stage door and climb onto the huge, state-of-the-art motor home style of transport and disappear behind the one-way windows. I stepped inside once. Invited, of course, not gate-crashing. I was allowed up the steps into the front, next to the driver from where I could pass my concert programme to the guys for signing. They were on the other side of a low partition. Breathless with excitement, I was so incredibly happy to be there. The previous eight or nine months I had spent in treatment for cancer. My personal goal was to recover sufficiently in time for this concert, which had been booked long before my diagnosis and it was great to have achieved it. I stood trembling with joy, hardly looking my best and feeling a bit vulnerable with newly growing hair. I was braving it without my usual bandanna. I’d taken to wearing red lipstick and dangly ear-rings like it was my feminine fashion statement. We all smiled. I said ‘Thanks for the music’ in a shaky voice and stepped down to the pavement, my treasured possession of a signed programme held close. It was over in seconds and meant the world to me. There have been many concerts over the years. Every UK tour means at least three dates and for those further than Manchester we book a hotel. We’ve had holidays in London wrapped round concerts at the O2 and the Royal Albert Hall. I’ve collected more autographs, photographs and had longer chats with band members and their musicians, but most of all I have happy memories of what they bring to the stage and the music which is the sound-track to my life.